After finishing A Levels, Alfie wasn't sure of which pathway to take, and upon visiting an Open Event at East Surrey College, he was impressed with the Reigate School of Art, commenting that "I like the vibe - it seemed like an independent and creative environment." He then enrolled on the Art & Design Level 4 Diploma, awarded by UAL. At College, he particularly likes focusing on 20th century sculpture, which has inspired some of his tactile works, including his 'string project'. 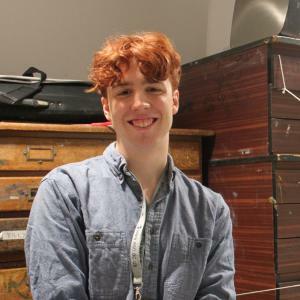 Alfie shared that "it's an exciting place to study - you're given the freedom to experiment with different techniques, materials and ideas." "I was surprised at how relaxed the interview was - it's not as scary as it seems. It seems like a great course, but I've applied to other unis so I am still keeping my options open!" Learn more about the dynamic Reigate School of Art, and explore our courses for September 2019.